At a time when parents and teachers and students have begun to make an impact on bringing an end to the education genocide that began in earnest in 2002 with NCLB, the corporate unions and their chief enabler, Diane Ravitch, have decided that their places at (or under) the Corporate Education table have to be protected, testing resistance be damned. Evidence: AFT has joined the corporate think tank, Center for American Regress, to whole-heartedly embrace the Arne Duncan of state testing in grades 3-8 and once in high school, PLUS "grade-span" testing, which will happen within 3-5, 6-8, and 9-12. In short, the testing scheme will have expanded if AFT and NEA have their way. We propose that in order to inform instruction, to provide parents and communities information about whether students are working at grade level or are struggling, and to allow teachers to diagnose and help their students, the federal requirement for annual statewide testing in grades 3-8 and once in high school should be maintained. . . . . However, we also believe it is critical to relieve the unintended yet detrimental pressure of high-stakes tests by basing federal accountability on a robust system of multiple measures. While these systems should include assessment results, states should only be required to include tests taken once per grade span—once in elementary school, once in middle school, and once in high school—in their school accountability systems. These systems should also include high school graduation rates at the high school level and other academic measures. While academic indicators should be substantial factors, states should also—as some are doing currently— include qualitative criteria such as school-quality reviews, climate and safety measures, success of students on college-preparation curricula, and/or measures of social and emotional learning. So look for a push by the Seligman/Duckworth crapologists who are selling the grit and self-control snake oil as "social and emotional learning." Does it work? Ask the Army. 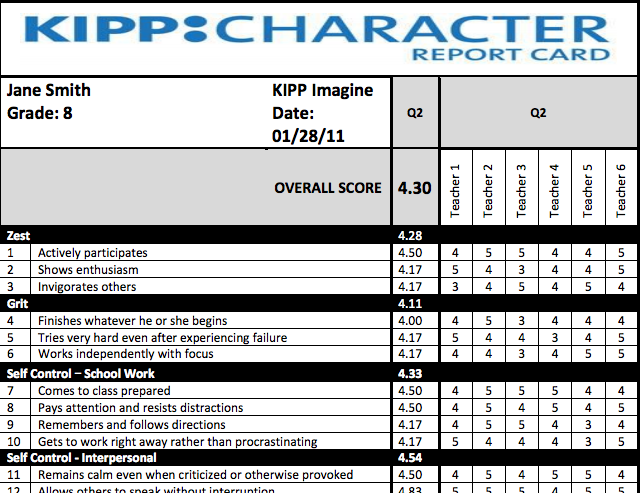 Think KIPP grade cards for "performance character" as another data point. (See example below). All accountability systems should be designed to help all students succeed and to identify and target interventions to schools with large achievement gaps or large numbers of low-performing, disadvantaged groups. The lowest-performing schools and districts should have to implement research-based, robust, and supportive interventions tailored to the needs of each school and community and be held account- able for doing so. In effect, then, the privatization by whatever lucrative means can be dreamed up will continue as Broad, Duncan, and Gates have planned--all with the blessing of the "resistance."